The UO has a long history of offbeat, colorful, and eccentric campus denizens. The tradition continues, as the following profile confirms. The story, written by UO communications specialist Matt Cooper, first appeared under the title “Ooh-La-La’s the name, entertainment’s the game” in Inside Oregon, the UO employee newsletter. At first, when he gives his name, people don’t believe him. Some do a double-take—come again? Others just smile, wondering if the joke’s on them. Jerry Springer was so impressed he did a show on him. Yes, you read that right. That is the legal name—you can check his driver’s license—of a thirty-two-year-old UO employee who serves up meals with a smile at Dux Bistro in the Living-Learning Center residence hall. But here’s the kicker: The moniker is only an introduction to the young man for whom entertainment is the real name of the game. Ooh-La-La—that’s been his legal name for fourteen years and he won’t reveal his given one—sat for an interview recently at the campus-area Starbucks. He sports thick, wavy hair and a trim moustache-and-goatee complement; he’s low-key and unassuming, even self-deprecating. But his alter ego is something else, entirely. Ooh-La-La plays a character in DOA Pro Wrestling, a regional entertainment circuit with wrestlers such as “Ethan HD” and “Big Ugly,” who grapple at stops in Portland, Keizer, Willamina, and elsewhere. In that arena, he is “Mister Ooh-La-La, the ‘faux French fashionista’”—a classic villain with a beret, cheesy accent, and arrogance to spare who parades around the ring area, catering to his wrestlers while trying to whip the crowd into a frenzy of animosity. “If an opponent is on the ropes, I’ll use a lint roller as a foreign object and stick it in their throat and choke them out,” Ooh-La-La says, matter-of-factly. 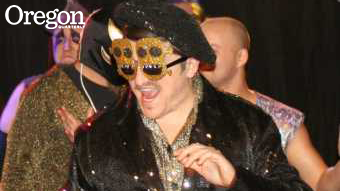 According to Garett Fertig, of DOA promotions, Ooh-La-La has developed quite a following on the circuit—which is to say, people thoroughly despise him. Ooh-La-La, who hopes to make a career out of professional wrestling, says the business walks a line between entertainment and sport. But he wouldn’t call it phony. “Everyone has figured out by now that wrestling is a show, but a lot of the violence is very real,” Ooh-La-La says. “You get body-slammed on a concrete floor, it’s going to hurt.” Ooh-La-La grew up in Eugene and graduated from North Eugene High School. He was a creative kid, if offbeat—he cheered for Freddy Krueger in the Nightmare on Elm Street horror movies. Entertainment was the obvious career path. Ooh-La-La has done standup locally and appears regularly on Eugene rock radio station KFLY’s The Donkey Show. Asked whether some might take offense to his characterization of the French, Ooh-La-La says he hopes the character is “so cartoon-y” that he’s not taken seriously. And the irony is that the real-life Ooh-La-La is quite likeable, according to coworkers at the Bistro. On a recent afternoon, as Ooh-La-La closed down the lunch shift, wearing a hairnet over that thick, wavy mane, colleagues described him as selfless and fun to be around. Ooh-La-La entertains the gang by scheduling group outings and keeping the kitchen rockin’ with music on an iPod. He has also shown a serious side, helping start a memorial fund for a longtime employee of housing and dining services, Chiyoko Chapman, who died in 2009, Martinez says. What those things will be, Ooh-La-La can’t tell you. But one thing the “faux French fashionista” will never be is the suit-and-tie type.